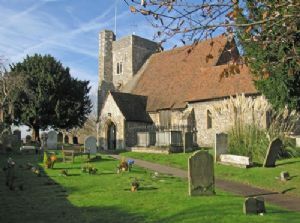 St Michael & All Angels Church stands centrally in the picturesque village of Hartlip, backed by orchards and flanked by the popular C of E Primary School (Endowed), established by Mary Gibbon in the 1600s. The school and church have enjoyed a closely knit relationship for centuries ever since. Many village homes still treasure Mary Gibbon Bibles presented to former pupils. We warmly welcome you to our church family, whatever your preference in terms of worship styles. Our Sunday services encompass All–Age worship to a more traditional Communion service each months, details of which can be found below. The school's Friday Worship takes place in the church each week during term-time, which is an open service especially for parents and family members. We have recently started a regular 'Messy Church' on a bi-monthly basis on a Saturday afternoon, which is a more informal way for families to explore the Christian message together through craft, games, story and music. We host occasional 'Heart of the matter' debates on topical issues, musical events, summer Sunday teas and a harvest supper. We seek to be a focal point for the community. We are keen to see the church building being used by the village community. It is open each day during daylight hours for quiet reflection and prayer. We also have an active ‘Friends of St Michael's' which offers practical and social benefit to both church and village.